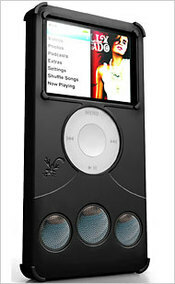 What’s good: Looking for a good protection for your 3rd generation iPod Nano? Well the ifrog Audiowrapz not only provides you with good silicone protection you are looking for and need for your iPod Nano but it comes with three integrated built-in speakers as well. Which is what makes the Audiowrapz stand out from the crowd. The built-in 3 speaker system performs to my surprise quite well which makes this case a great value for its inexpensive price and simple design. What’s bad: You have to remove the nano completely from the case so you can recharge it., but the iPod does slide in and out of the case effortlessly. What’s the bottom line: Easy to use protective case with surprisingly good audio quality for a reasonable price without sacrificing your battery charge. They simply connect through your iPod Nano’s headphone jack. Design: Measuring 4.25″ length (adding about 1” to the length of the nano) x 2.25′ width x 0.53″ thick, the Audiowrapz is a 100% silicone (rubber) case which covers and protects the nano while leaving the viewing screen and wheel open for nano operations and viewing. To protect the screen a clear screen protector is included in the package. The case is made of silicone and has a great feel to it that also increases the grip factor to your thin nano. Available in aqua blue, black treadz, gun metal grey, hot pink, mint green, neon green, pink panther, and red ruby. You can do additional personalize to your nano by selecting a pop, sports, colors, girly, artistic, culture or nature Screenz to cover the scroll wheel. I had absolutely no trouble flipping the top reinforced corners of the case back to slide my iPod Nano along a plastic sleeve until the Nano connects to a 3.5mm jack connector plugs into the Nano and then pull the corners back over the Nano’s corners. The Audiowrapz covers the Nano so that the screen and wheel is framed and fitted by the casing perfectly. In the Box: ifrog Audiowrapz. That’s it; can it be any simpler than that? No, nothing else is needed. Performance: I’ve tested the Audiowrapz for over three weeks now while in my car, office and while exercising. In terms of general performance, the Audiowrapz was impressive and very easy to use. The three speaker system sounds much better than I expected with very little distortion. The volume is not that loud but it’s still too loud for me to crank it all the way up while at the office which is where I use it most. I no longer have people sneaking up behind me as I did while wearing the earplugs while at work. The size still fits in my front pocket of my pants so I have not removed the case except to recharge the iPod. I generally like bands that may not be main stream like 16 Horsepower (YouTube link) and Jolene (YouTube Link) and now my coworkers are barrowing my Audiowrapz to give them a try without having to switch earplugs. What’s Missing: I would like to see it designed so that I can still chage the iPod without having to remove the case even though it does remove very easily. Cost: You can buy the ifrogz Audiowrapz from the manufacture at http://ifrogz.com/products.php?cat=412 for $24.99 USD. Audiowrapz is also available at Wal-Mart stores nationwide for $19.99.